If there is one audience for this US authored book of 29 papers, then it is educational policy makers and, more likely, those who aspire to be so. Whilst these collective papers anticipate a particular future for us all, many also tell us that we are there already. We are, it appears, now post the digital age. Being a ‘digital native’ or being ‘born digital’ is now only a prerequisite for the next era. In their introduction, Daniel Araya and Michael A. Peters observe that, ‘…we have moved from the postindustrial economy to the information economy to the digital economy to the knowledge economy to the “creative economy”’. It is an era, it is argued, which requires us to recognise the value and importance of innovation, imagination, creativity and the like. It is these that are seen to be the bedrock on which the new economic world is to be founded and the drivers for new forms of learning and teaching. As with most edited volumes there is not one coherent discourse although there is a recognized consensus on the key concepts. The papers in Part One: Educational Policy, have a greater congruity, largely due to the influence of particular contemporary educational theorists such as Richard Florida. His joint paper with Brian Knudsen and Kevin Stolarick, ‘The University and the Creative Economy’, for instance, argues that the overselling of the university’s role in the economy as its ability to transfer research to industry, generate new inventions and patents and spin off its technology in the form of startup companies misses the deeper and more fundamental contributions made by the university to innovation, the larger economy and society as a whole: ‘…policy-makers have somewhat neglected the university’s…powerful role...in generating, attracting and mobilizing talent and establishing a tolerant and diverse social climate’. UK readers might wonder at this and consider whether we are passing our US colleagues in the academic dark! Daniel Araya’s paper, ‘Educational Policy in the Creative Economy’, is very much the scene-setter, not just for this first section but also for the whole book, as he examines the creative economy discourse in the context of education and the changing dynamics of the global economy. In Part Two: Technology and Economy, the new era is expressed in terms of technology’s relationship with digital networks rather than the command-and-control systems of industrial society. The critical importance of digital networks now, we are told, is as platforms for collaborative innovation. The recurrent theme in this section is the perceived paradigm shift that appears to be occurring as digital networks become more embedded, what challenges they create and how they relate to an economic future. A central concern about creativity, innovation and collaboration in a commons-based peer production context, highlighted by John Howkins in ‘Catalyst’, is that of intellectual property rights. As he points out, ‘The laws that regulate how we get access to other people’s ideas and inventions, whether we can use them and share them, and how we can make money out of them, are obviously crucial’. Part Three: Culture and Curriculum, looks to examine the need for a different model of education that goes beyond the one that has so successfully supported a Fordist economy. Paradoxically, we might consider the idea that, both in the US and the UK, schooling has moved more to an industrial model of production with the setting of attainment targets and regular testing the more that the economy has become reliant on skills related to imagination and innovation. 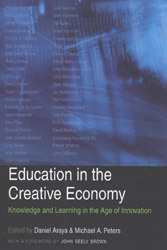 Nevertheless, the capacity for schools to prepare students for an economy based on innovation is a central concern of a number of papers, particularly Tina Besley, in considering questions surrounding youth identity in a digital age, and Patrick Whitney, in Learning in the Creative Economy, who argues that schools need to become creative hubs at the centre of networks of learning and innovation. Ellen McColloch-Lovell, in more doubtful mood, challenges the idea that the ‘creative campus’ is genuinely creative. Not every paper chimes with the thrust of the title but most, at least, provide a broader context. Charmingly, two authors who have no apparent background in design penned the only paper on design. Unfortunately, it shows. Throughout the papers, several writers have a bash at articulating their own definitions of ‘creativity’. None of them make much of a fist of it and we should be grateful for that. Indeed, definitions of the term, in most instances, have little or no bearing on the main thrust of their arguments. What we can learn about ‘creativity’ from this volume is that there are as many uses of the term as there are writers. Those responsible for curriculum design in the art and design sector might also benefit from reading this collection of papers but I suspect, only if they are also committed to trans-disciplinarity and distributed learning networks in which learning is collaboratively generated and shared. Allan Davies is a consultant in Higher Education Art and Design. Prior to this he was a Senior Adviser at the Higher Education Academy and before that he was Director of the Centre for Learning in Art and Design (CLTAD) at the University of the Arts. In the early days he was Head of Art and Design at what is now the University of Worcester and even further back he was programme leader for graphic information design at what was then Falmouth College of Art. During some of this he was a GLAD committee member. He is currently a QAA reviewer.